Touvaly Lite is a novel drag and drop utility app for making "pseudo copies" of files, folders, CD's and volumes, preserving folder structure. What is a pseudo copy of a file? A pseudo copy of a file is a file with all the same attributes as the original file (creation date, modification date, type, creator, name, etc.) but with empty contents. You can use Touvaly Lite to create virtual catalogues of collections of files which use very little space. You can double click on a pseudo copy, and Touvaly Lite will open the original, in the appropriate app for that item. You can search or browse the pseudo file catalogues by their "outer" file attributes, just as though they were the real files. Because of this feature of Touvaly Lite, it is very useful for photographers and musicians with very large collections of photo and music files that are stored on external devices and media. 1) Pseudo copies are made openable. 2) The resource fork of the original is copied to the pseudo copy. Launch the app and the status window displays. 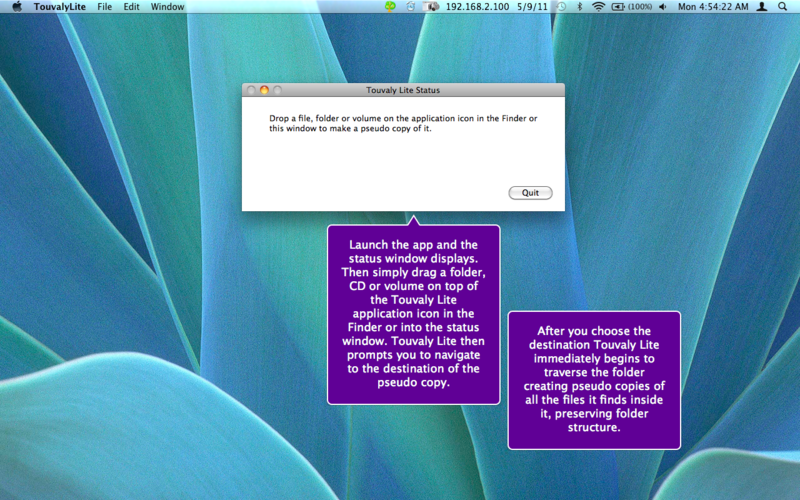 Then simply drag a folder, CD or volume on top of the Touvaly Lite application icon in the Finder or into the status window. Touvaly Lite then prompts you to navigate to the destination of the pseudo copy. After you choose the destination Touvaly Lite immediately begins to traverse the folder creating pseudo copies of all the files it finds inside it, preserving folder structure.